Families have discovered the joys of cruising—unpack only once, activities available for all ages and abilities, special programs for children, and plenty of included food and entertainment. Royal Caribbean’s newest mega-ships, Oasis and Allure of the Seas, have proved extremely popular with families, in part because each is like an all-inclusive resort itself. 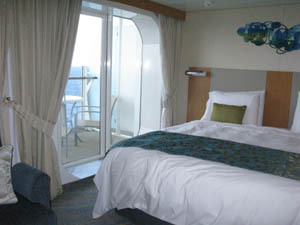 The scenery and activities on onboard rival that of ports-of-call. Royal Caribbean's Allure of the Seas. But booking accommodations that work for both parents and children can be tricky, especially since larger rooms and suites are limited. To ease the situation this summer, Royal Caribbean is offering a family-friendly deal for the Oasis and Allure of the Seas, ships that sail alternating Eastern and Western Caribbean itineraries. But you need to hurry. Until April 13 vacationers booking two or more Central Park- or Boardwalk-view balcony staterooms that are grouped together will receive a $200 onboard credit per stateroom, up to a maximum of three staterooms for a total of $600 onboard credits per group. “With triple- and quad-occupancy staterooms on both ships filling up quickly, this offer provides families with an affordable alternative for a memorable cruise vacation,” says Betsy O’Rourke, senior vice president of Marketing, Royal Caribbean International, in a press release. The offer is only valid for new U.S. and Canada individual bookings and is limited to availability. Onboard credits are valid only during the booked sailing. 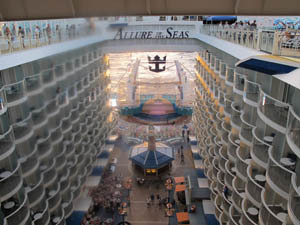 The Oasis and Allure of the Seas, the world’s largest cruise ships, sail year-round and round-trip from Port Everglades. They each span 16 decks and can carry 5,400 guests in 2,700 staterooms. They feature Royal Caribbean’s neighborhood concept of seven themed areas--Central Park, Boardwalk, the Royal Promenade, the Pool and Sports Zone, Vitality at Sea Spa and Fitness Center, Entertainment Place and Youth Zone. All the included amenities on these beautiful ships make cruising a budget-friendly vacation option. Photos by Larry and Beverly Burmeier.